The footage was recorded in January, taken by the operator of a whale-watching boat in Cabo St. Lucas – at the southern tip of the Baja California peninsula in the west of Mexico. A juvenile humpback whale surges out of the water, and splashes down on his side. He proceeds for several minutes with his natural display, rising up and crashing back into the water, to the delight of people on the nearby shores and also those on a whale-watching boat. It was the equivalent of a whale fireworks display. Yesterday, SeaWorld reported a loss of more than $25 million for the fourth quarter of 2014, while attendance to the company's 11 parks fell 2.2 percent, from 4.5 million to 4.4 million, during the same period a year ago. Attendance fell 4.3 percent during the entire year, from 23.4 million in 2013 to 22.4 million – down a million, but that's still too many people who go through the gate. Yet perceptions of SeaWorld seem now indelibly changed by the 2013 documentary "Blackfish," which had serial broadcasts on CNN in addition to other widespread showings. 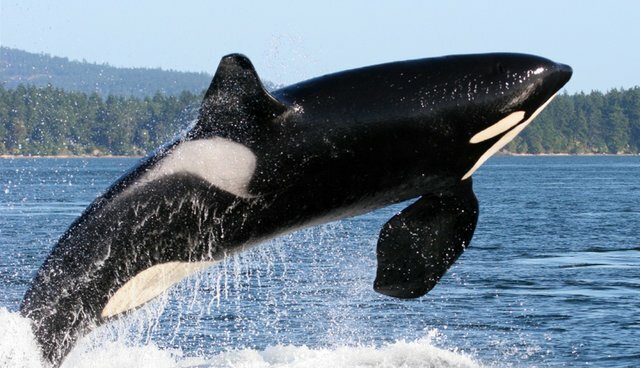 The company's stock is down 41 percent over the last 12 months, after the public learned of the prior history of wild captures of orcas, the deaths of several trainers, and the opinions of so many leading whale scientists that the animals cannot possibly have a rich life in tanks. SeaWorld's CEO even stepped down at the end of last year amid this mess. The interim CEO has the challenge of moving the business away from holding complex marine mammals in tiny tanks. But for now he's taking the wrong approach, saying the company is launching a major branding campaign starting in April to defend a practice that's bound to be more unpopular as animal protection values become more intensely felt throughout the whole of society. The campaign is aimed not at people whose minds are made up but, according to the Orlando Sentinel, it "will focus on those in the middle" – those who are still undecided about the company's conduct. Sounds like a good time for animal groups to step up their efforts to remind people that there are extraordinary places to see whales and to patronize businesses built around that experience. No one needs to watch whales kept in small enclosures and forced to perform tricks, when there are so many better alternatives - starting with the world's five oceans.